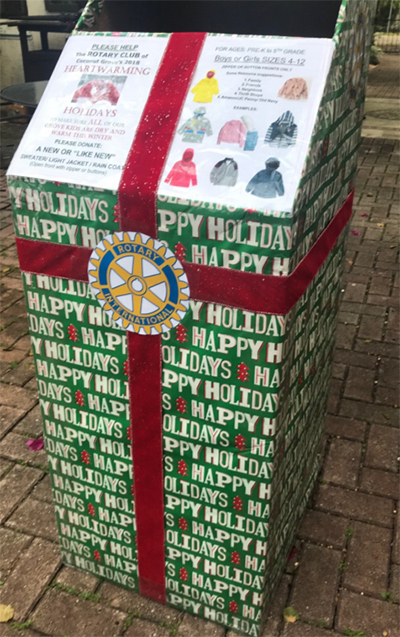 “As winter approaches, we want to make sure that all the children in our community will stay warm and dry,” says Rotarian Kathy Kesler who started the initiative. Rotary has placed collection boxes at key locations in the Grove including Coconut Grove Laundry and Dry Cleaners, CVS, the post office, the Sailing Club and Milam’s. In addition, a collection box is at the City of Miami Riverside Center, 444 SW 2nd Avenue. The objective is to try to get a lightweight jacket, sweater, fleece hoodie, or raincoat for children ages 4-12 (Pre-K to 5th Grade) with front buttons or zippers in new or “like new” condition donated so we can distribute them to the local schools with children in need before they go on Holiday Break.